An amazing selection of homes for sale can be found in Golden Beach. Community offers older homes built in the 1970th to some of the most luxurious new construction homes one can imagine. Most of the older homes usually sell as a teardown, but I find that some of them have such a charm and were built in such a way that updating them would certainly be an option. One such home is located at 654 Golden Beach Drive. Located on the Golden Beach Dr, this home for sale is located on a spacious waterfront lot, it offers 3 bedrooms, two of which are on the main level with the master bedroom on the second floor with very spacious bathroom. High vaulted ceiling on the main level with lots of windows and open floor plan and direct waterfront views the minute you come through the front door. It also has a boat slip and inground pool. This lovely home has so much character it's a shame to tear it down. The main road Ocean Drive cuts through the Golden Beach and separates it into beachfront homes to the East and Intracoastal waterfront homes to the West toward Aventura. Not all of the homes for sale in Golden Beach are waterfront. The once that are west of Golden Beach Dr and Ocean Drive are all dry lots. Many of the lots have been vacant for years, but due to high demand for single-family homes, developers finally building on them. See Market Report for the Golden Beach Real Estate. 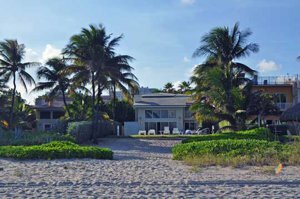 * The highest sale price year to date in Golden Beach was a beachfront house at 115 Ocean Blvd that closed for $14,000,000, that is $1,879 per square foot. The estate sold in just 6 months and was listed by our team at Dezer Platinum Realty. * There are currently 44 properties for sale in Golden Beach, ranging in price from just over 1.2mil to $23mil asking price. View Homes for Sale in Golden Beach. The current market supply for luxury properties Miami-Dade area is out of balance, with supply outpacing the demand. That is seen throughout the area, not just Golden Beach. The absorption rate is at a high point of 3-4 years based on the existing supply and sales. Market price adjustment is coming and potential buyers are waiting for that. It is evident by the closed transactions what price buyers are willing to pay. Property owners need to make a decision as to will they take the market price or not, or risk having their property go stale and not sell. Leonard Woshczyn is a Broker Associate with Dezer Platinum Realty in Sunny Isles Beach. 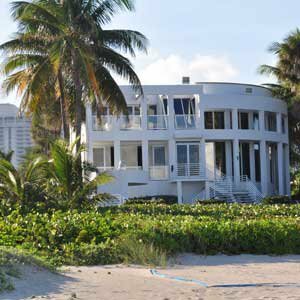 If you are looking to buy or sell your Golden Beach home or condo in the area give us at Condosandhomesmiami.com a call 786-505-4786. Or browse the listings and information on the area on our site.